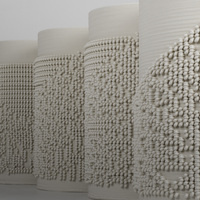 Timea Tihanyi is a Hungarian born cross-disciplinary artist and ceramist living and working in Seattle, Washington. Tihanyi earned an MD (Semmelweis University, Budapest, Hungary, 1993) in neurology/neuropsychology, a BFA (Massachusetts College of Art, Boston, 1998) and an MFA (University of Washington, Seattle, 2003) in ceramics, where she currently teaches as a senior lecturer in the Interdisciplinary Visual Arts program. Tihanyi’s installations and participatory works have been exhibited in Brazil, Australia, Denmark, Spain, the Netherlands, and the US, including Shepparton Art Museum, Henry Art Gallery, Bellevue Art Museum, Mint Museum of Art and Design, Society for Contemporary Craft in Pittsburg, Clay Center for the Arts and Sciences, Foundry Art Center, and International Museum of Surgical Science. She is the winner of the 2018 Neddy Award in Open Media. Tihanyi is the founder and director of Slip Rabbit, an experimental research and education studio focused on the advancement of digital ceramics. Sponsored by the art department's Cooley Gray Fund. Free and open to the public.